The Thoroughbred industry is full of good stories, and few told better ones than Cot Campbell. The man who pioneered racing partnerships through the development of Dogwood Stable passed Oct. 27 at 91. Campbell brought hundreds of people to racing ownership through Dogwood and entertained thousands with his narratives, yarns, and anecdotes. He always had time for a good story and was so full of them he penned not one, but three books (the first two published by BloodHorse’s Eclipse Press): Lightning in a Jar, Rascals and Racehorses, and Memoirs of a Longshot: A Riproarious Life. Reading a Cot Campbell-penned book is akin to reading a transcript. We can’t help but hear the author’s Southern drawl as we follow along. His charm drips from the page. The prodigious Campbell also developed a Dogwood newsletter that graced our mailbox, filled with updates on the Dogwood doings, photos of clients, and the general good times had by all. He also blogged and produced a podcast online, where he was able to wax poetic on the subject of his choosing—more often than not, the pleasures—and the exasperation—of Thoroughbred ownership. Through Dogwood Stable, he won a pair of classic races—the 1990 Preakness Stakes (G1) with Summer Squall, and the 2013 Belmont Stakes (G1) with Palace Malice. In 1996 he and his partners ventured north to Woodbine and won the Breeders’ Cup Juvenile Fillies (G1; and an Eclipse Award) with Storm Song. At the sale, his strategy of buying prospects early in the sale while other prospective buyers were perhaps sitting on their hands waiting to see how the auction might unfold, was so well known, BloodHorse MarketWatch did a study of his approach to see if it actually worked (by the way, it did). Campbell also was one of the first to entrust some horses to an up-and-coming trainer named Todd Pletcher. That worked out pretty well, too. “Surely a highlight of our Lexington tour was the visit to one of the greatest figures in the history of American sports. This was the fabulous Man o’ War. 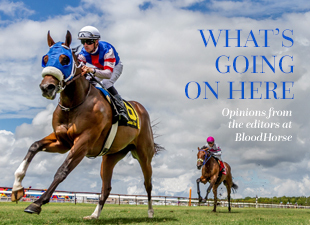 “As you can imagine, in the early days of Dogwood while we were pioneering what was then a radical approach to owning racehorses, accountants and lawyers representing prospective clients drove me absolutely crazy. In fact, so intense was my frustration with their automatic and incessant negativism with my product—a racehorse partnership that was being painstakingly presented as a highly speculative, tax deductible, pleasure-oriented venture—that I had designed (tongue-in-cheek, of course) a tombstone with a suitable epitaph.